Welcome to Coffeyville, Kansas! We are pleased to see that you are interested in visiting! Located in the corner of southeast Kansas, we are a small town full of history, culture, and fun! We know we can make your visit here memorable, so reach out and let us help you plan your stay! Explore different types of art in the downtown area all year round. Everything from murals on old historic buildings, art covered electric boxes, down to chainsaw art sculptures created by the Coffeyville Community College students. The sculpture garden located at the corner of 8th & Beech Street houses over 70 unique chainsaw art sculptures created by Coffeyville Community Collegeart students. This technique of chainsaw art sets CCC apart from any art department around! Go explore the art and post a photo of your favorite sculpture with #VisitCoffeyville! 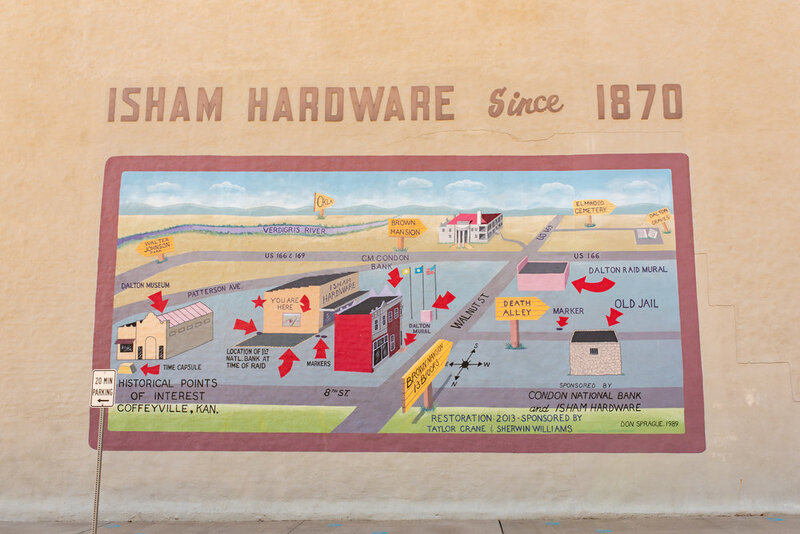 Rich in color & accurate in history, the murals painted by the late Don Sprague transport you back in Coffeyville History. Between 1988 and 1992, Sprague painted 14 murals in and around downtown Coffeyville. Before he began painting Sprague spent hours doing research making sure each mural was historically accurate. The murals also contain Don’s son name “Tim” hidden in the painting. The dots after Sprague’s signature represent the number of times “Tim” appears in each mural. All but two murals have since been restored by Coffeyville Community College Art instructor Michael DeRosa. Check out the electric boxes that are covered in paint by local artist. This was a project done by Downtown Coffeyville to help beautify the downtown area and bring some color! Some boxes include history of Coffeyville, some are to showcase businesses in Coffeyville, and some are just art to enjoy.